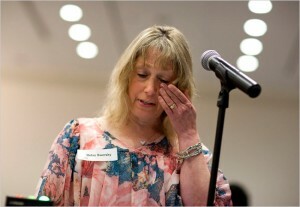 My cousin testified before the FDA oncology advisory board on Tuesday about her experience taking Avastin. This is a tragedy, to deny the only drug that is keeping a 51 year old woman alive. You have to wonder, are the advisory panel members so rational in all their behavior and choices? Are they always so razor-like in their oncology decisions? These experts have an agenda, here: It’s to be perceived as scientists, even when their knowledge is imperfect and exceptions to the rule stand right in front of their eyes. 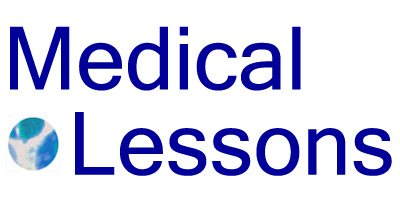 But clinical medicine calls for flexibility, and tailoring of treatment to each case, and caring about each person, including those who fall at the tail, or in this case better end, of any Kaplan-Meier survival curve. What would Larry Kramer do about this, I’ve been thinking: He’d scream, really loud, so loud he might break his eardrums. He’d wonder why others, affected and near, aren’t doing the same. And he’d understand why this picture is on page 3 of the business section, and not on the front cover; it’s because people don’t want to look or see or know or think about it too much, because it hurts. That is the normal heart, and this is a normal response to what’s happening to women with metastatic breast cancer. I enjoy reading your blog, and have done so for a while. On this topic, I must disagree with you. Avastin is not being pulled from the market. Oncologists retain the flexibility to prescribe Avastin for their breast cancer patients if they deem it clinically-appropriate. As I understand it, this is an issue of marketing – rescinding the FDA approval of Avastin for BC forbids Roche from promoting the drug for that illness, a decision which is entirely appropriate given the now substantial large body of evidence indicating that it doesn’t work. While there may be isolated examples of efficacy, that is not, and should not, be the basis for FDA approval. If it were, then many, many ineffective drugs which achieved a few CRs or PRs in a flatly negative clinical trial would be approved and promoted. The FDA approval standard depends on this rigor, and so does public health. I’m sympathetic for your cousin and glad to hear about her good experience on Avastin, but the vast majority, literally thousands of women, who experienced no benefit at all, yet are at risk of potentially fatal side effects. I guess that loss of FDA approval will have an impact on reimbursement of Avastin for BC too, which I didn’t mention in my first comment. But I think you will agree that, in a necessarily resource-contrained world, CMS- or insurance-reimbursed medicines should have the requisite supporting data to justify that reimbursement. Anyway, just my few cents I guess…. Herman, Thanks for writing in. Most oncology drugs are quite toxic. And many are ineffective. My thinking is that Avastin is not so different from many other treatments. The problem with the FDA’s reversal is that although the drug would be technically available, off-label, it wouldn’t be covered by insurance, resulting in bankruptcy and/or earlier deaths in those women who are benefiting and tolerating the drug. As with other drugs, Avastin should only be given upon careful discussion with the patient and upon careful, informed consent. From a moral and economic standpoint, I think it would help, also, if doctors were salaried: If oncologists’ decisions in prescribing cancer drugs were disconnected from a profit motive, there’d be more trust that they are doing the right thing when they recommend this or any treatment. Ideally, a breast cancer specialist would give, say, two rounds of Avastin and see if the patient’s tumor responds. If it doesn’t, the doctor would be honest with the patient, explain that it’s not helping, and stop the drug. Ah, very good points. Thanks. I understand the companies are hoping to identify a biomarker to help select those patients who do/will benefit with Avastin, which would be great. But I agree that the strategy you suggest is a good one too. Thanks again. Elaine – I’m sorry to hear that your cousin is in this terrible position. You make the point very well that there are real people and real lives behind the outlier statistics. There’s no doubt in my mind that there needs to be a complete overhaul of the rules and definitions for the chemo drugs approval process if we are to have any hope of effectively treating AND preventing metastatic breast cancer. Besides those issues, I hope that Genetech and the insurance companies can find an arrangement so that people like your cousin, can continue with this drug without undue financial penalty. I also hope that Genetech continues to study people like your cousin, to better understand why this drug works so well for them but not for others. Thanks also for your comment. I think the problem is that doctors can’t know in advance who are the “super-responders,” i.e. the outliers. Avastin doesn’t target a specific genetic defect; it works, at least in principle, by cutting off the blood supply to a tumor. So the only way to know, within a single patient, is to try the drug upon informed consent, if the patient wishes to go ahead, and see if it helps. I do hope that Genentech, and others, such as NIH-funded researchers – who might be more objective – will study women with triple negative disease not just for why they respond (or don’t) to Avastin, but for newer, better drugs. This debate illustrates the essential tension between evidence-based medicine manifest as a policy versus a suggestion. It is at the core of efforts to cut costs and it will arise more frequently as we patients become more aware of treatment options that are not available to us because the evidence is not strong enough to support their coverage. As a patient who is alive (I think) because of some long-shot chemotherapies and as an advocate for evidence having a greater role in the practice of medicine, I am torn, pessimistic about the possibility of a happy medium. See this commentary [2011;305(24):2569-2570. doi: 10.1001/jama.2011.866] by Sheila Rothman in JAMA for an account of how this battle is being waged by patient advocates. Thanks so much for writing in. You’re right, this debate illustrates a tension between EBM as a policy versus as a recommendation. I will look over Sheila Rothman’s commentary. So far, based on my conversations (and reading comments, op-eds, etc) by “patient advocates” on this, I am concerned that some are, essentially, willing or even eager to “take a hit” on this particular drug, as part of a long term strategy of seeming to be reasonable, cost-conscious, etc. Many don’t realize that Avastin is no more dangerous than plenty of other treatments. But the press is all over it, and “medical scientists” have scrutinized it in the past two years; this hasn’t happened so much, and as it should, for all cancer drugs. So sorry to hear about your cousin, Elaine, it is never an easy position to be in. My view is very much the same as Herman’s and the FDA’s – this is a marketing decision, not a clinical one. Based on the evidence and testimonies presented, a minority of women do indeed do well on Avastin, but the majority do not, and the survival data from one of the trials actually suggested that they would be better off on chemotherapy after 2 years. Personally, I don’t think it is a good idea to treat the majority of patients with HER2- disease and expose all of them to the life threatening systemic side effects such as bowel perforations and stroke to help a few (who cannot be identified upfront) that may do well. That’s a rather nihilistic approach. If you have a targeted agent then it needs a target or biomarker to accompany it, or you are basically using it in an untargeted fashion like chemotherapy. It’s a shame that the real opportunity to save what could have been a good drug for a small subset was lost due the lack of the relevant biomarker and choosing to try and garner the market for all patients. Interestingly, there is data that showed that the majority of Avastin sales in breast cancer was actually off-label, ie not what it was approved for. The drug WILL still be available to women who decide to take it (or wish to continue to do so) in consultation with their oncologist – it is in the NCCN Guidelines and CMS have said they will cover it – essentially as off-label Compendia listing. This means that for those who are receiving Avastin for HER2- breast cancer should still be able to a) receive it and b) get reimbursement covered. Withdrawal of an indication does not mean it wouldn’t be prescribed, although many oncologists may well reconsider in the light of the scrutiny on the side effect profile. The ODAC recommendation to the FDA (the Commissioner makes the final decision at the end of this month) merely means that Genentech cannot actively promote it given the lack of solid clinical evidence in breast cancer for the patient population it was approved for. To be clear: I’m not suggesting that all women with triple negative disease be treated with Avastin. But if they don’t respond to other available drugs for BC and give informed consent, they should be able to try this med, like any other. This is an incredible and wrenching conversation. There are two aspects to consider that I want to add, even as late in the day as it is. 1) It show one thing wrong with the rush to move products into practice. We define who will be helped AFTER the fact; AFTER other women die, others are made sick….this is not like Herceptin, where the biomarker was clear and so was the subsequent therapy. 2) This is also an issue the breast cancer advocacy community needs to take up IMMEDIATELY with the insurance companies and their powerful lobbies. Those women who are helped should CONTINUE to be helped and reimbursed by their carriers as they are now. The fear that payment will be withdrawn? That is something we can deal with NOW, while additional research is conducted. I think to assume that it is all over for women who are currently benefiting from Avastin is counterproductive. Where are the national breast cancer organizations in helping with this issue? I’m haven’t heard much discussion on this score. Elaine, I saw the photo of your cousin in the paper, and the letter from her father. Let’s determine what we can do to continue to help her while the other questions are addressed.